Using services which can be injected in multiple controllers. The first possibility to share data via $scope is a bad idea. If you share data via scopes, you have to know controllers' parent-child relationship. That means, your controllers are tightly coupled and the refactoring is hard to master. Some AngularJS examples save the data on the $rootScope, but the pollution of $rootScope is not recommended. Keep the $rootScope as small as possible. The event based possibility to share data via $emit, $broadcast and $on is a better approach in comparison to scope based one. The controllers are loosely coupled. But there is a disadvantage as well - the performance. The performance is ok for a small application, but for a large application with hundreds of $on listeners, the AngularJS has to introspect all scopes in order to find the $on listeners that fit to the corresponsing $emit / $broadcast. From the architecture point there is a shortcoming as well - we still need scopes to register $emit, $broadcast and $on. Some people also say - communication details should be hidden for the same reason we keep $http hidden behind a service layer. There are 5 guidelines for avoiding scope soup in AngularJS. The last 5. rule is called Don't Use Scope To Pass Data Around. It advices against using scopes directly and against event based approach. Last but not least - think about the upcomming AngularJS 2. It doesn't have scopes! In my opinion, the preferred way for sharing data between controllers in AngularJS 1.x is the third possibility. We can use services. A service can keep data or acts as event emitter (example is shown below). Any service can be injected into controllers, so that conrollers still don't know from each other and thus are loosely coupled. I will refactor and extend one example from this blog post. The author of this blog post implemented two controllers for two panes. In the left pane we can input some text and add it as an item to a list in the right pane. The list itself is placed in a service (service encapsulates the data). This is probably a good idea when you have different views or controllers in conditional ng-if. But if controllers exist in the same view and show their data at the same time, the list should reside in the controller for the right pane and not in the service. The list belongs to the second controller. This is my opinion, so I will move the list into the controller and also add a third "message controller" which is responsible for messages when user adds items to the list or removes them from the list. We thus have three controllers and one service. The idea is to apply the listener pattern (also known as observer) to the service. The service acts as event emitter. Every controller can fire an ADD or REMOVE operation and register a listener function to be notified when the operation is done. The added / removed item acts as data passed along with operation into all registered listeners for the given operation. The live example is implemented on Plunker. The first picture shows the adding process (click on the button Add To List) with a message about the successfully added item. The second picture shows the removing process (click on a link with x symbol) with a message about the successfully removed item. emitAddItem - notifies listeners that are interested in adding an item to the list. The item is passed as parameter. emitRemoveItem - notifies listeners that are interested in removing an item from the list. The item is passed as parameter. onAddItem - registers a listener function that is interested in adding an item to the list. The listener is passed as parameter. onRemoveItem - registers a listener function that is interested in removing an item from the list. The listener is passed as parameter. clear - removes all registered listeners which belong to the specified controller. The controller is identified by the scope parameter (simple unique string). That's all. Happy New Year! The first button sends a GET request to /persons to receives all available persons. If you click on this button, you will see three persons received from the imaginary backend. There is also a proper validation. If you type e.g. 4, no person will be found because no person with the ID 4 exists in "the backend". If you type some wrong ID which is not a numeric value, an error message will be shown as well. The third button sends a POST request to /person to create a new person or update existing one. 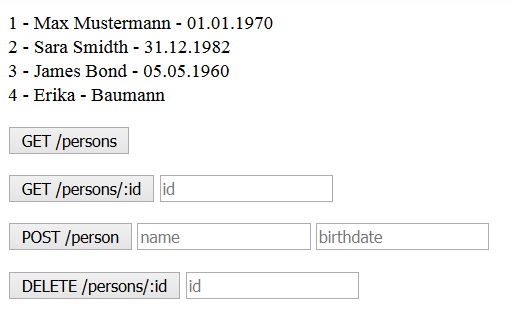 The input fields name and birthday are required. 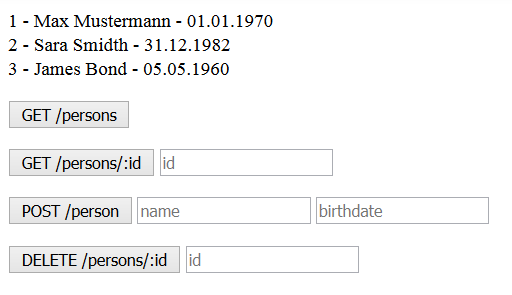 You can type a name and birthday for a new person, sends the POST request and see the created person recived from "the backend". 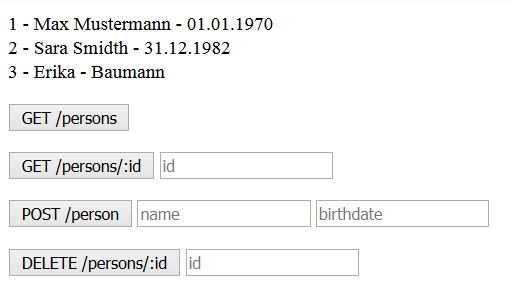 Now, if you sends a GET request to /persons (the first button), you should see the created person in the list of all persons. The last button deletes a person by sending the DELETE request to /person/:id. The deleted person is shown above the buttons. Click on the first button again to ensure that the person was deleted and doesn't exist more. Let's show the code. First of all you have to include the file angular-mocks.js after the file angular.js in order to overwrite the original $httpBackend functionality. The most interesting parameter is the url. This can be a String like /persons, a regular expression like /^\/person\/([0-9]+)$/ for /person/:id or a function that receives the url and returns true if the url matches the current definition. These methods return an object with respond and passThrough functions that control how a matched request is handled. The passThrough is useful when the backend REST API is ready to use and you want to pass mocked request to the real HTTP call. In this example, we only use the respond. The respond can take the object to be returned, e.g. $httpBackend.whenGET('/persons').respond(persons) or a function function(method, url, data, headers, params) which returns an array containing response status (number), response data (string), response headers (object), and the text for the status (string). The file app.js demonstrates how to use the $httpBackend. // does the person already exist? Now we need a custom service that encapsulates the $http service. The service will get the name DataService. It is placed in the file service.js. The service DataService is invoked by a controller which I named DataController and placed in the controller.js. The current implementation has one shortcoming. The text Loading ... is not shown at all because the response is delivered very quickly, so that user doesn't see it. It would be nice to delay HTTP calls in order to simulate the network load. For this purpose we can use the $provide service and register a service decorator for the $httpBackend. The service decorator acts as proxy. If you look into the source code of the $httpBackend, you can see that the $httpBackend is created by the constructor function(method, url, data, callback, headers, timeout, withCredentials). The four parameter callback is responsible for the response. We have to provide our own implementation which I named delayedCallback. The delayedCallback function invokes the original callback with a delay (here 2 seconds) by means of setTimeout(). We delegate the proxy call to the $httpBackend instantiation, but with the new delayed callback. The injected $delegate object points exactly to the $httpBackend. The full code is shown below.